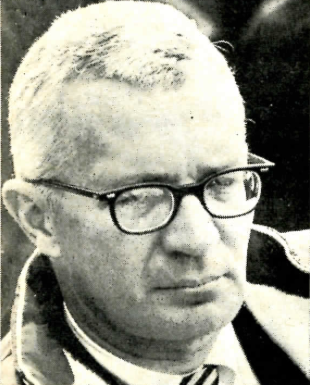 The first part of this season was spent by Wayne Gapp, Jack Roush, Al Buckmaster, and Bill Jameson in getting their Maverick to go and handle properly for Pro Competition. When the combinations were pretty much figured out , the team went out and splurged on a magnificent paint job in metallic blue and gold. At the AHRA Nationals, both plans paid off, as the Maverick was top qualifier at 9.75, and was chosen as the best appearing car of the event. 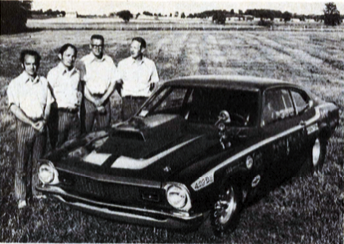 Wayne Gapp and three other Ford engineers with heads-up racing experience combined to figure out why Ford’s Boss 429 breathes so asthmaticallay, and then applied their solutions to a winningly prepared Maverick race car. DEARBORN IS FAMOUS for two Ford shops. One is slightly bigger than the other. The first is owned by the man whose name is on the front door, and the second one, located on Outer Drive in a small garage, belongs to Wayne Gapp and Jack Roush. Both are engineers and both have raced longer than they care to remember. 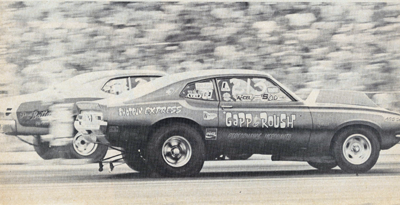 Teamed up with the Gapp and Roush Racing Enterprises are Al Buckmaster and Bill Jameson, also engineers and racers, and also successful at both occupations. Bill’s strongpoint is making special pieces while Al Buckmaster is an expert at flow testing heads and manifolds. Naturally, a team needs a starting point, and the Maverick turns out to be the lightest car on the market with the smallest wheel base acceptable for Pro Stock use-103 inches, which tops the 100 inch lower limit. 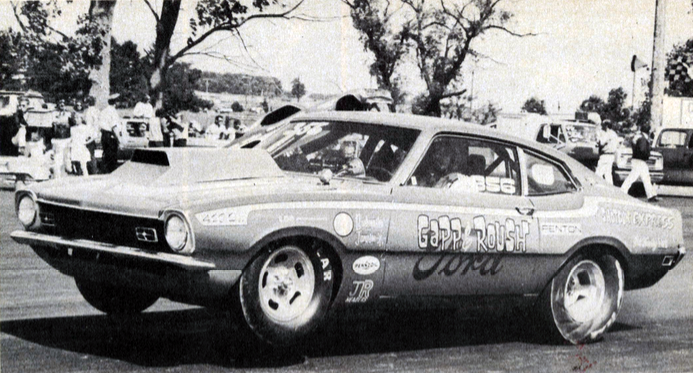 In fact, Gapp and Roush succeeded in holding the 7 pounds per cubic inch weight as well as the correct Pro Stock weight distribution without having to go to acid dipping. Hours of cutting and swiss cheese drilling replaced the cubic money needed for dipping. While the window glass is still there to meet the rules, non functional pieces such as window regulators are now a thing of the past. Maverick interior uses Solar seats, skinny steering post, Moon tach and S-W gages, bright white wheel and raised custom Hurst custom shifter. The entire dash comes out after removing four screws. 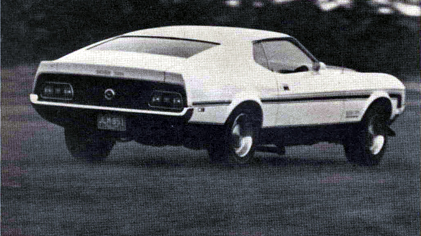 To make room for the Boss 429 all suspension points had to be moved two inches further out. Then, to keep the front wheels from going “TILT” on take-off or during the run, the boys did a series of checks, moving the suspension through its travel range with the front springs and shocks out of the way. Slotting the suspension mounting holes helped in finding the correct locations. 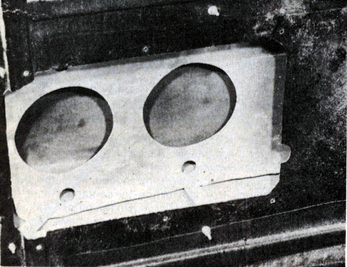 Washers which form part of the mounts were then welded in place, covering up the slots, to permanently locate the pivots. Some strange things had to be done to the lower control arm struts such as making hinges and pivots to replace the usual rubber bushings. 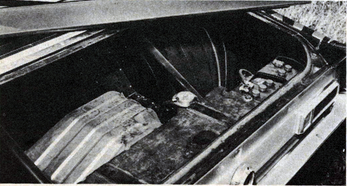 Also, the drag link was lengthened a couple of inches and the standard Maverick steering gear gave way to an exotic right hand drive gear ordered from Ford of England. The advantage is that it fits on the outside of the frame and doesn’t interfere with the engine. Originally, the spring towers were turned 180 degrees to get them out of the way, but changing springs and shocks became a hassle, what with removing the fender each time. Now there is a set of shallow towers with caps that accept the special front shocks. Those shocks are used not only for damping but also to limit the front end travel. 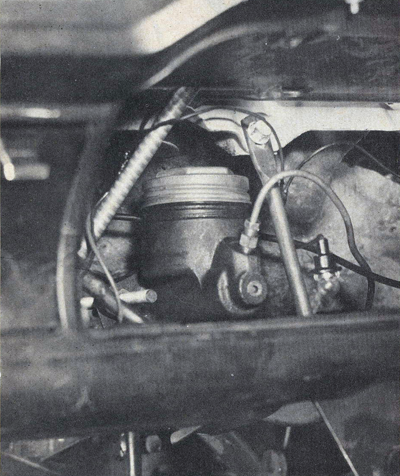 Adding space bushings between the shock and the tower or switching to a shock with a shortened rod limits the lift at the nose of the car. The general idea is to have the front end lift quickly for good initial weight transfer and then settle back down so that the car will be low and stable during the run. Dave Landrith, of the Landrith Corporation, gets credit for an interesting rear suspension that departs from the traction bar route and achieves full control with springs and shocks alone, in Mopar fashion. The spring eyes are now closer to the axle housing. There is also more metal in the front of the spring all of which combines to make it act like a traction bar. New support plates welded to the floor pan at the torque boxes(just in front of the rear wheels) have a series of holes for mounting the springs higher or lower. This controls the amount of lift or squat that you get out of the suspension on takeoff. Big tires call for more room at the rear wheel housings and this in turn made it necessary to move the springs closer to- gether. 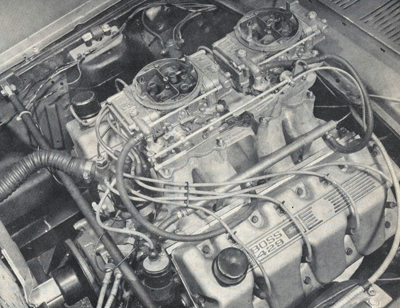 Next thing you know, Gapp and Roush were narrowing the gas tank, which brought several fringe benefits such as better control of the fuel slosh and a small weight savings. A suspension will not work unless the car is stiff enough to back up all the pivot point locations. 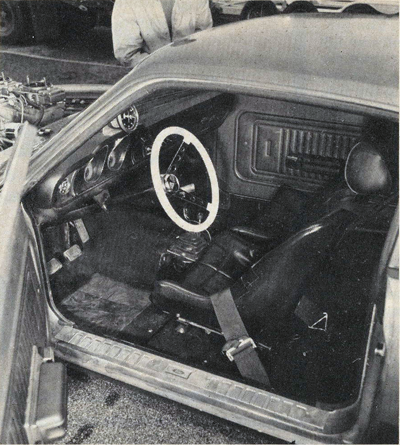 By the time Bill Jameson was through heliarcing, the Maverick acquired not only a roll bar but also a bridge like structure that extends back to the rear spring shackles. Add to this a crossmember that forms a drive shaft loop and ties into the roll bar cage as well as to the torque boxes in the floor. The extra weight proved beneficial to both safety and traction. 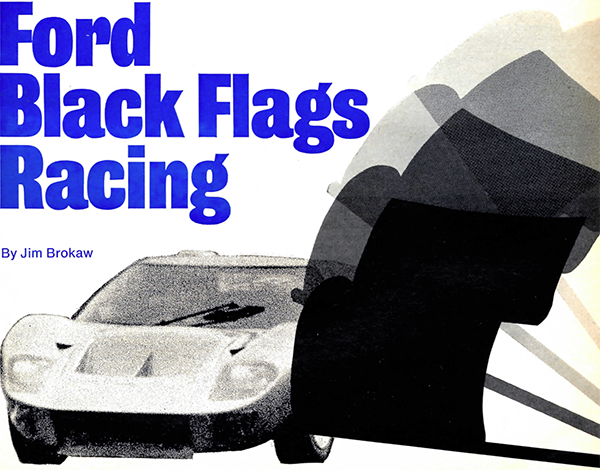 The Ford racing program generally alternated between lavish spending and penny pinching. 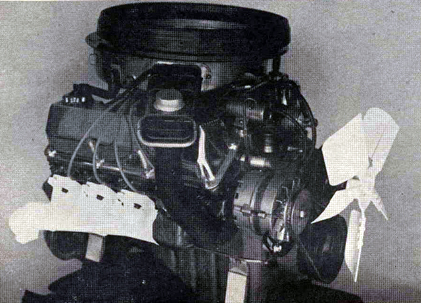 As far as the Boss 429 engine was concerned,the spending went to NASCAR, while the slimmer pickings made their way to the drag strip. Then came a series of last minute attempts to make the 429 perform on a strip-a dollar short, an hour late. 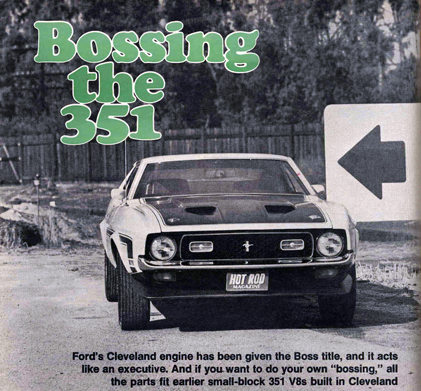 The 429 Boss went out of production back in 1970 but, there are still enough of them around to put quite a dent in drag racing circles and Wayne feels that it could be superior to the existing cammers both in power and in durability. In fact Gapp and Roush now have a back log of orders for ihose engines, having proved them at the strip. 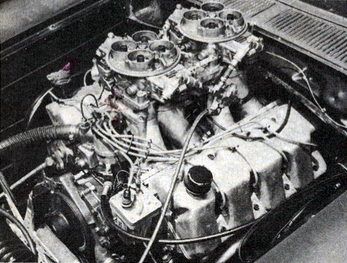 The original Boss 429 engine was designed for Daytona and destined to go under the low hood line of the Talladega. As a result the huge ports have a very low entry point and must swing through a 90 degree angle to connect with a valve. This results in uneven fuel distribution and costs horsepower. The trick is to straighten out the flow then give it a more direct shot from the intake manifold to the valve, In effect, the entrance of the port must be raised to straighten the flow. Wayne Gapp hit on the idea of installing some crescent shaped cast aluminum inserts that raise the level at the floor of the ports. Raising the roof of the port to retain the round cross section then breaks through to the outside, and additional inserts are needed there too. The inserts are retained with an epoxy bond as well as by Allen screws. 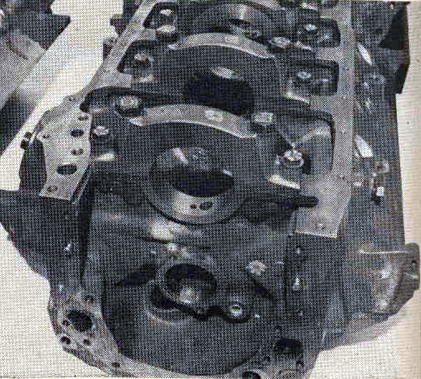 The result is a port height that reaches almost to the level of the rocker arm covers. While the port diameter is a little smaller than before, 2 1/8″ instead of 2 3/8, they flow just as much as the original NASCAR head on the flow bench. Even better, the smaller crosssection area and the higher velocity of the air fuel mixture coming through results in much higher mid-range and improved response at the drag strip. 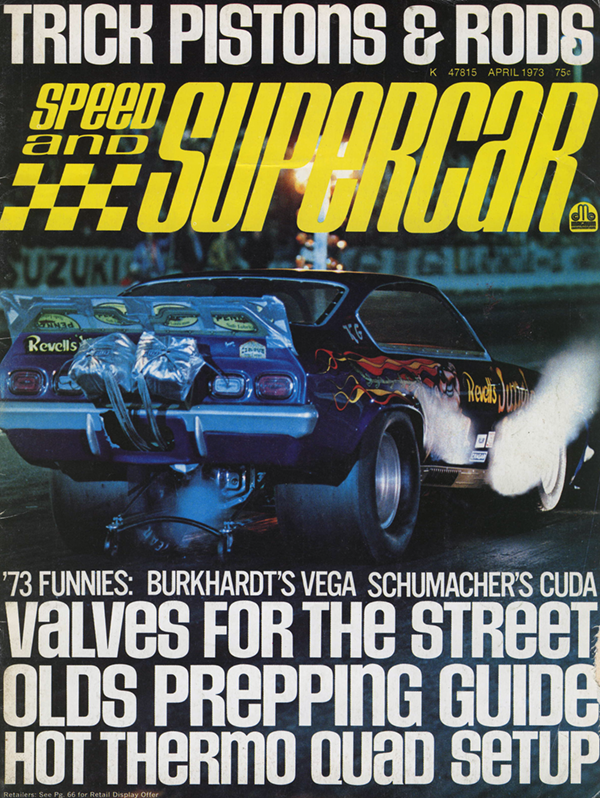 The dyno says twenty horsepower and the ET slips at the strip show that the change is worth between one and two-tenths. Boss 429 combustion chambers stop just sort of having a full hemi shape. Two small pulled-in quench areas (which gave rise to the “Blue Crescent” name) proved to be a nice conversation piece most beneficial in coping with NASCAR rules. 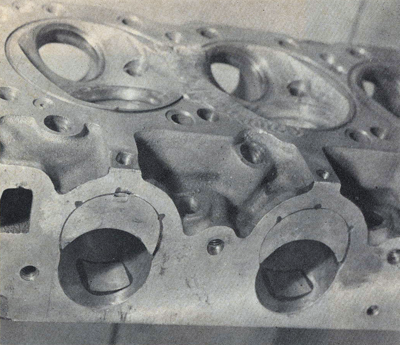 However drag racers look for more compression than long haul circle track burners and had a hard time fitting a high dome piston to this tricky shape. 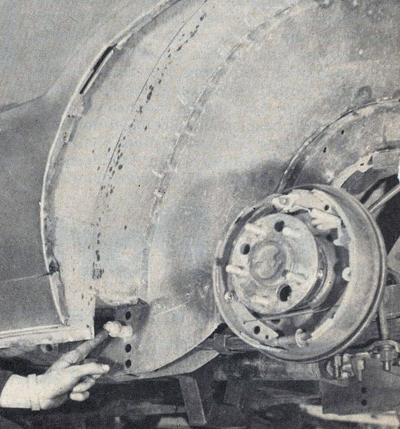 Wayne Gapp machines the combustion chambers to a hemi shape, removing the two side sections. 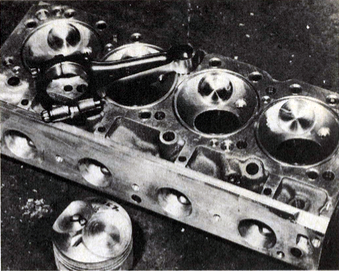 He also made matching tooling to cut pistons, and is able to get close clearances and high compression. 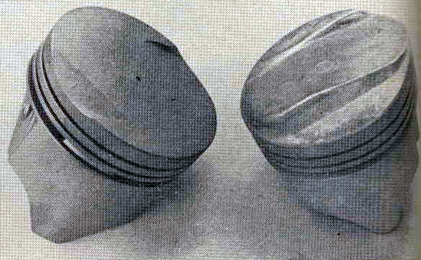 Two high compression Boss pistons are available. The quench one with the two side steps carries part #C9AX6110B. 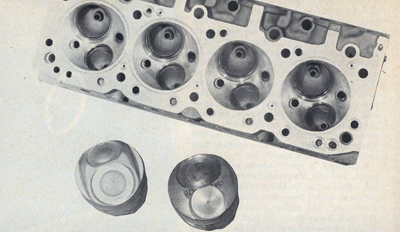 The hemi piston carries part #C9AX6110BH. Valve pockets for those pistons depend not only on cam overlap and decking but also how deeply you can sink the valve into the head. This treads with a heavy step on many standard ideas that drag racers have, but Wayne prefers to bring the valve further into the head, which allows him to keep a smoother piston contour. 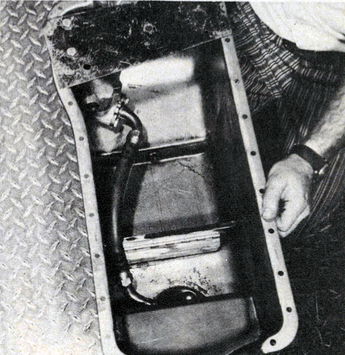 He then provides ample relief around the valve, blending the seat with the combustion chamber walls in smooth tulip shape and actually gains flow rather than losing any. If you happen to have a street Boss as opposed to the NASCAR job, all of the modifications still apply, In fact, both heads are machined from the same basic casting. Exhaust valves on both engines measure 1.7 inches and there is a 1/8 inch difference between the 2.25 street valve and the 2.37 Boss valve. 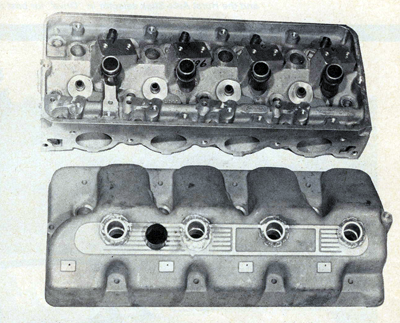 By the time Gapp and Roush get through with the seat inserts on the aluminum head, they blend in a wider radius for the larger valve, remove the casting burrs from the stock port and gain another 25 horses. Theory has it that the centrally located spark plug is the very best you can get. 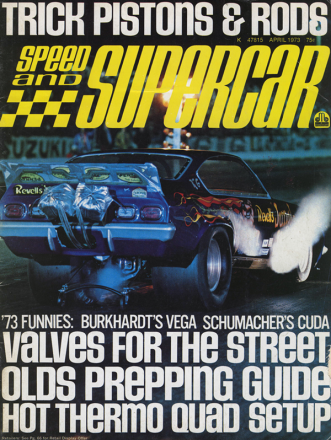 Unfortunately this conflicts with the valves and so Wayne Gapp, just like his Mopar counterparts has gone in search of two plugs per cylinder. A tremendous amount of work is involved including new spark plug wells that are heliarced to the rocker covers and seat against the heads. So far, there is only one set in existence and they haven’t been tested enough to make the next move. 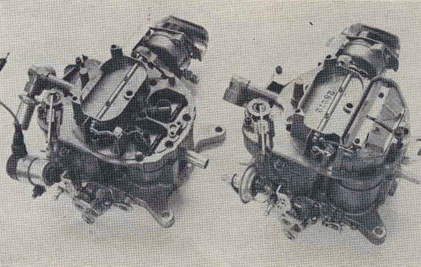 The manifolding choice has narrowed down to a Weiand intake topped by a small size plenum or open chamber under the carburetors. Tests with an independent runner system were unsatisfactory and even the Mopar boys seem to have departed from this since Gainesville. To gain a little extra cooling, the bottom of the manifold has been sealed. 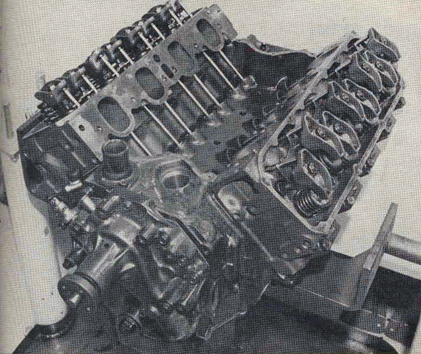 Three types of rods with different lengths were used on a 429 Boss. The early street series were 6.55 inches long. They were good, durable, but too short for high compression pistons. The production rod was 6.60 inches long, center to center. Best one of the lot was the 6.785 inch NASCAR rod which is longer, stronger and expensive. It is built for bullet proof performance during a 500 mile race, but most drag racers prefer lighter and less expensive aluminum rods. You will need 0.660 deck clearance with an aluminum rod as opposed to .040 inches on steel rods. Either way, clearances should be cross-checked by claying up the top of the pistons. The rest of the bottom end includes a street type of Boss crank with grooved mains and a blocked off oil supply to the lifter galleries. 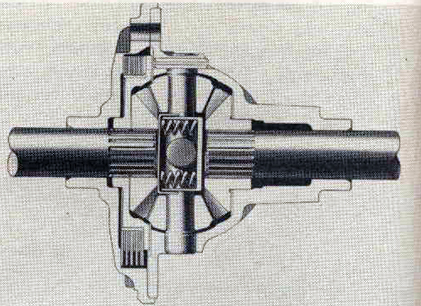 Wayne Gapp suggested not blocking the special pressure relief spring in the double entry oil pump. On a cold start, you can coil bind the spring, raise the pressure to 300 psi and blow the oil filter clear off the engine. The cam is a PPX 6250Dl-4 available through either Holman and Moody or Gapp and Roush. This cam will be released shortly through Ford dealers under Part #DLZX6250-EA. You have a choice of rocker arms. The stock one can be used providing you lighten it up and replace the lock nut and adjusting screw with the hollow 427 adjusting screw that has an interference thread. The Nascar rocker arm has the advantage of offering a 1.75 ratio as opposed to 1.60. Part number for it is C9AZ-6565-B and with it you will need a smaller new shaft C9AX-6563-A and a matching support C9AX-6531-A. 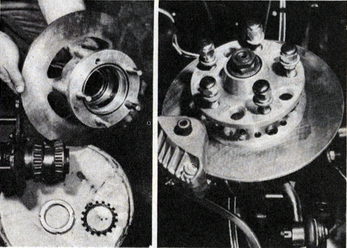 Completing the valve train are the original nylon gears and the straight chain drive. How do you make it longer lasting? “Change it every four weeks,” says Gapp. Gapp launches his Maverick at 7500 RPM with a big heavy flywheel and a dual disc clutch that is a carryover from the days of his 1965 AFX Comet. 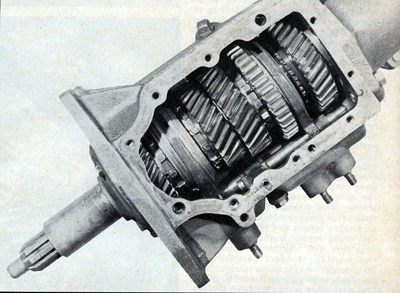 A Hurst shifter is used to move some pretty unique parts inside the transmission. Among them there is a 2.54 first gear which provides lots of torque for getting out of the gate. Doug Nash Racing Enterprises does some tricky things to the upper three gears. They remove the brass blocker rings at the synchro. Next they also do away with the row of teeth that are engaged by the synchro sleeve. A precision ground shoulder now makes room for pressed on sleeves with wider, longer and stronger teeth – just about indestructible, unless you go around practicing missing shifts. Two out of every three teeth on the synchro sleeves are removed on all gears but first. Shift bars and the snap rings were tossed together with the blocker rings. Now, shifts are completed at 7800 to 8000 and the car goes through the eyes at 7500 rpm. 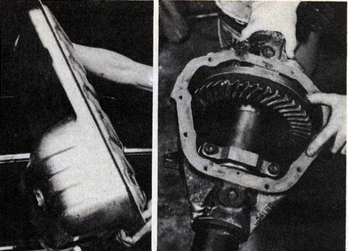 A 3 1/8 inch drive shaft with a heavy duty Ford truck yoke leads to a 5.12 Dana rear. Most recent change has been the switch from 8 to 10 inch wide rims which seems to have made the slicks more stable. Wayne is not partial to any particular tire maker and works with all three. The ET slip makes the selection. Warmup runs are made with a spectacular smoke screen, but during the run smoke is a no-no because it costs time. It’s clear that Gapp and Roush are on the way to producing some serious competition in the Pro Stock ranks.